When you parent a child whose life literally depends on not being exposed to a certain food, the seemingly benign term “food allergies” becomes a terrifying one. Growing up, my brother had an allergy to pork, something my mom discovered when he was 3 years old. As a baby, he cried a lot and used to scratch his skin to the point of bleeding. He also had a hard time sleeping. My mom knew something wasn’t right but it wasn’t until a particularly bad episode after she watched him eat a lot of sausage at a family gathering that she pieced things together. His reactions became more severe over the years and eventually, we didn’t have any pork in the house. I also have food allergies myself to strange things (celery, broccoli, bananas, and processed cheese) but they are not life threatening. When I was a teenager, a second or third cousin of mine (whom I had never met), died of a peanut allergy while on a trip to Europe with her school. Hearing the story was shocking and the first time that I ever considered how serious allergies could be. I later heard the story again when a high school teacher of mine recounted it to the class because she had been one of the chaperones on that fateful school trip. My first two sons have no allergies other than skin reactions to medical tape. Our daughter Miss Optimism began showing signs of being prone to allergies as a baby. We just didn’t realize it at the time. She had cradle cap, which many babies get. Our oldest son had had a mild case of it himself. But hers was not a mild case and nothing we tried seemed to help. We eventually had to use a prescription because it was so severe that it made her head bleed. We learned from the doctor that severe cradle cap is sometimes tied to eczema, a skin condition our daughter developed while still a baby. Sometime before she turned one, Miss Optimism developed a severe ear infection and was put on antibiotics. We gave her one dose of penicillin and immediately, her torso was covered in huge, red hives. She also seemed to be having a harder time breathing. We called the pharmacist and doctor and of course discontinued the penicillin and gave her an antihistamine. She was then labelled as having an allergy to penicillin and we were talked to about the possibility that she may have the triad of eczema, allergies and asthma. The asthma appeared less than 2 weeks after her third birthday. I don’t remember the first time Miss Optimism had a reaction to tree nuts. I don’t even remember which nut it was she had a reaction to. I do remember the first time I had to call an ambulance. That day , we had had a Valentine’s party here. We had invited a bunch of kids over, done crafts, played games, eaten fun food, and said good-bye to the last of the guests. Some of the kids who had come had brought Valentines cards and treats with them. I was too busy with all the hubbub to take much notice of what treats came in. Miss Optimism was five at the time, but because of some of the medication she was on for her lungs was very tiny for her age. She was the light of our life and in an instant, it seemed that that light could be extinguished. I was in the kitchen cleaning up from the party when one of the other kids called out “mom“. I knew, just knew. I heard something in their voice, knew in that one word. As I ran to the next room, I grabbed the phone on the way, knowing I would need to call for help. I saw her struggling for air and called 9-1-1 before my brain fully registered what was happening. There was a candy wrapper on the floor and I was able to piece it together. The chocolate was a popular brand and it did not contain a “may contain nuts” warning anywhere on the packaging, but it was manufactured in a factory where hazelnuts are used. I gave her an antihistamine, held her and prayed while we waited for the ambulance to arrive. We had known before that day that her allergy was serious, known even that it could kill her, but knowing and KNOWING are too different things. That day changed everything. After that day, I became obsessive about reading labels, not letting her go to birthday parties without me, asking questions of other parents, worrying whenever she wasn’t in my sight. Miss Optimism is 13 now and still lights up our world. She has become her own allergy advocate and even her sweet tooth doesn’t get in the way of her making sure something is “safe” before she eats it. I no longer worry when she isn’t with me that she may accidentally eat something she shouldn’t. She carries an epi-pen and has been trained on how to use it. She smells food before she puts it in her mouth, even if she has asked about nuts and been told there aren’t any. Her tongue and throat will get itchy from the smell if it does contain nuts so she uses that as an extra precaution. Our life is affected by allergies, but not defined by them. Our son Einstein is on a gluten free diet for his Aspergers (it has made a huge difference) and another of our sons is lactose intolerant, so I have had to adjust the way I cook and the way I shop, but it is possible to live a fairly normal life even if your child has food allergies or intolerances. It is never too early to start training your child to be their own advocate. As soon as they are old enough to talk, teach them to ask about food before they eat it. Be their advocate. Educate friends and family about the importance of being food-aware and the many ways allergens can be hidden in foods. Don’t take chances. It goes without saying not to take chances in exposing them to what they are allergic to, but also don’t take chances when it comes to a reaction. When in doubt, call an ambulance. Reactions should always be taken seriously. 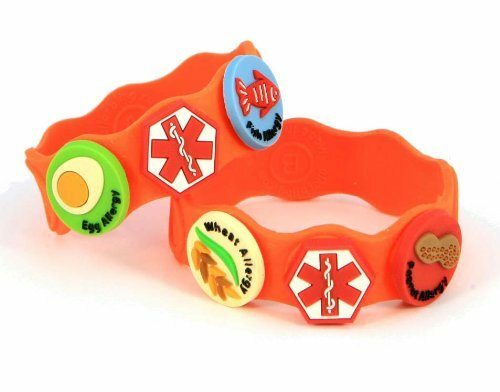 Get your child a medic alert bracelet. If ever a reaction causes them to lose consciousness, this will alert those on the scene to what is going on and help paramedics and medical personal to treat your child. For our daughter, we have an Allerbling bracelet. You can buy them with different “charms”. She has had it for years and we love it. It is made of silicone, so it’s great for those with allergies to metal or latex and it is the only type our daughter will keep on because of her sensory issues. When your child is old enough, have them help with cooking and baking. This will give them a better understanding of how there can be hidden ingredients in food items. Train the people in your child’s life how to use an epi-pen. The one we use now actually literally talks a person through the process. (yes, a talking epi-pen!) Be sure that instructors, care givers, teachers, friends’ parents, grandparents, anyone who will have contact with your child knows how to use an epi-pen and is willing to do so. Be prepared. An epi-pen can save your child’s life. Carry an extra. They are expensive, but not having one with you could cost a lot more than you want to consider. Also carry an antihistamine. I have antihistamine in my vehicle, in my purse and at home. My daughter is now old enough to also have one in her bag. Educate yourself. Know the signs of an allergic reaction in your child and other possible signs that could occur. Their reactions and even their allergies can change over time. 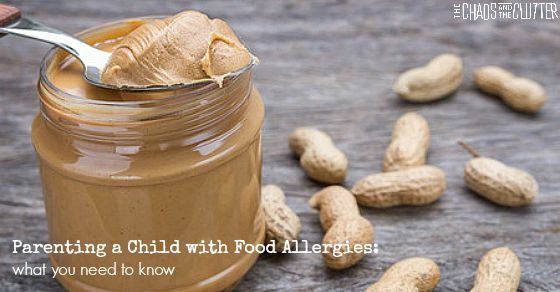 If your child has an anaphylactic allergy, do not allow that food in your home. No exceptions. You may even choose to hang a sign on your door. If they have an intolerance, you can choose whether to adjust meals for the whole family or just for that particular child. For our son with the gluten intolerance, I sometimes cook gluten free for all of us and other times, just adapt his meal. Learn to let go. You won’t be able to go to college with your child to read labels before they eat. You know your child best so you will know when they are ready to start attending events without you where there could be potential for allergens to be present. It’s hard to let go but take small steps towards it to build up their self-advocacy skills. Start with safer environments where you have already briefed the adults present. Once precautions are taken, they can lead a normal life. It takes time to adapt for the whole family to adapt, in particular if there are several food allergies, but life can return to normal. Some of this reading is for you, while some is to help you educate those around you so that they can help you through this journey with your child. 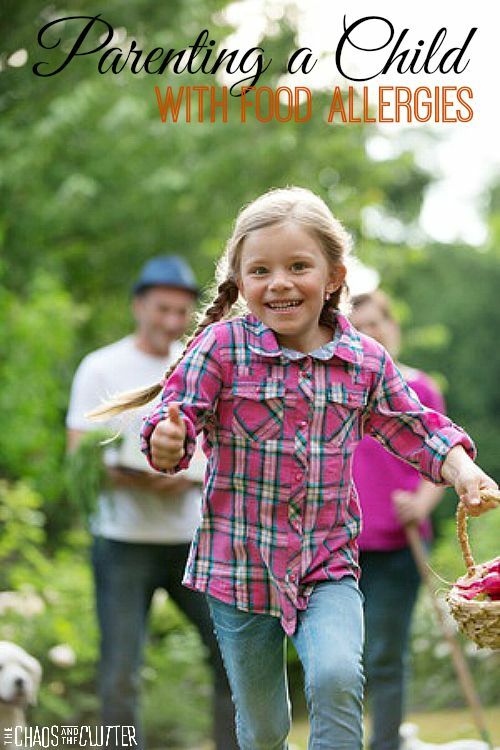 If your child needs to be on a gluten free diet, you can find our gluten free recipes here. Thank you for the tips! My 11 month old has a suspected peanut allergy and I’m very scared and overwhelmed. This makes me feel better for sure! I hope you’re able to find some answers Jen. It’s easier when you know for sure and can take precautions and make changes and then move on with your lives. I have known only two people in my life to have food allergies and I must say it is quite scary. I could not imagine how stressful it could be. My children have not had any allergies but I know to always be cautious about others. I love the idea of the bracelets. That is really helpful. Especially for children who cannot talk yet. What an amazing invention. My 8 month old was just diagnosed with peanut and egg allergies. I’m considering removing all the peanut butter from our home (we eat by the spoonful before this). We have had a blood test to determine the severity of the allergy and am waiting to hear. I’ve already got him a bracelet (that probably won’t fit him) and have trained family members with the EpiPen. It is SO SCARY for me to know that one bite of food could have such a reaction. I’m basically terrified. Thank you, this was super helpful! My son has eczema and he had episodes of wheezing a few times when he was sick (though he was never diagnosed with asthma, he’s very little still…) We have some food intolerances (celiac) in our family, but our discovery of his nut allergy scares me a little because we don’t know how it will develop from here. So far he’s had a whole-body rash, but never had an anaphylactic reaction. We thought he was allergic to mango when he got that rash, but apparently not!